One of Emma’s favorite stories that I constantly recount is the day of her birth. When she’s sad, and is difficult to console, I’ll quickly jump to that memory, and she’ll quiet down, stop the sniffling, and bury herself in the warmth of my recollection. That day was five years ago. I was 25 and wasn’t prepared at all of what motherhood entailed. I never knew what sacrifice actually felt like until it manifested at that moment I held her in my arms. I knew at that specific moment that my life was for her. My life was not just my own, but all my decisions would somehow compose and impact her make up. Her life was so fragile, and at five years, it still is, even more so, because her comprehension, emotions, cognition, self esteem is somehow affected by me. Every time I look at her changing face, I know it’s slowly morphing, even as I look. The shape is elongating. Her smiles are changing her look and revealing more complex emotions. Before, as a baby, it was simple to know whether or not she was happy. Now, sometimes a smile can be forced, or secretly trying to hide a hidden hurt. Now, sometimes, I have to guess and prod. Sometimes she asks me if I miss baby Emma, and I say yes. I do…not because I dislike big girl Emma, but because she was much simpler then. I could protect her then. But now, this is the time when who she is will be tested and formed. And I can only trust and have faith that God will carry her through the years of challenge and even hurts. I want so badly to protect her as much as I can. It hurts to know that one day, all I can do is cry and pray for her. I want so bad to know that she will never experience heartbreak or pain, or rejection, but I know sometimes those are the things that will help to define her. This July 1, she turned five. So Perze and I bought her a Tiffany’s crown charm, one she’s picked out herself. it turned out to be the perfect reminder that no matter what happens, she’s a child of the King. It also serves as a reminder to Perze and I that she doesn’t belong to us, but we have the greatest privilege to raise, guide, and love her. 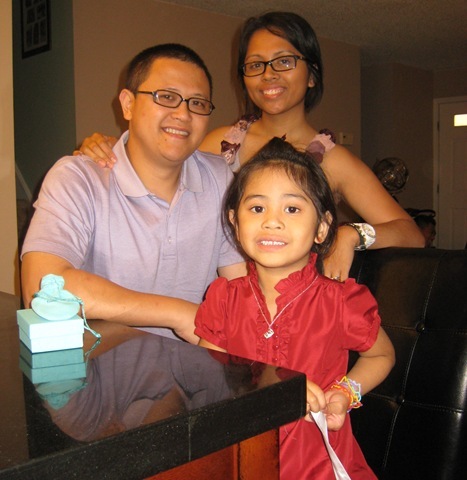 This year, after the grand joint celebration with Zi’s 1st year, we had a small family get together at our house to celebrate her 5th birthday. I took her out that morning, let her shop for a big gift (she chose the disney princess doll set at Target). Then for dinner, everyone came over, and she was able to blow out her candles on the flower cake that Tito Fred sent her. 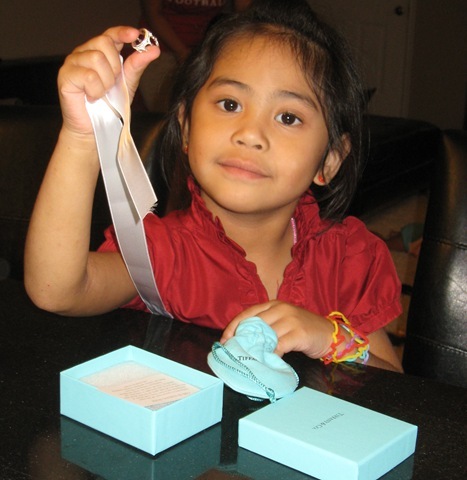 Lastly, we handed her her present, her first ever Tiffany’s jewelry. Emmanuelle Grace, we can never say how much we love you. Even before you were born, you were always in our conversation, and when I was pregnant with you, you were always prayed over. When you were born, every moment spent with you was a labor of love, and as you grew older, I can honestly honestly say that aside from your dad, you were my best friend. You and Zi are truly my heart, walking outside of myself, a piece of myself that I can physically see and forever cherish. You are so blessed my love. Please, as you grow, know that no matter what, you are a child of the King. Grow in love towards Him and He will give you the desires of your heart, make all things possible, and give you life and make you prosper. We love you sweetheart.